“Mermaids at Brighton” by William Heath (1795 – 1840), c. 1829. 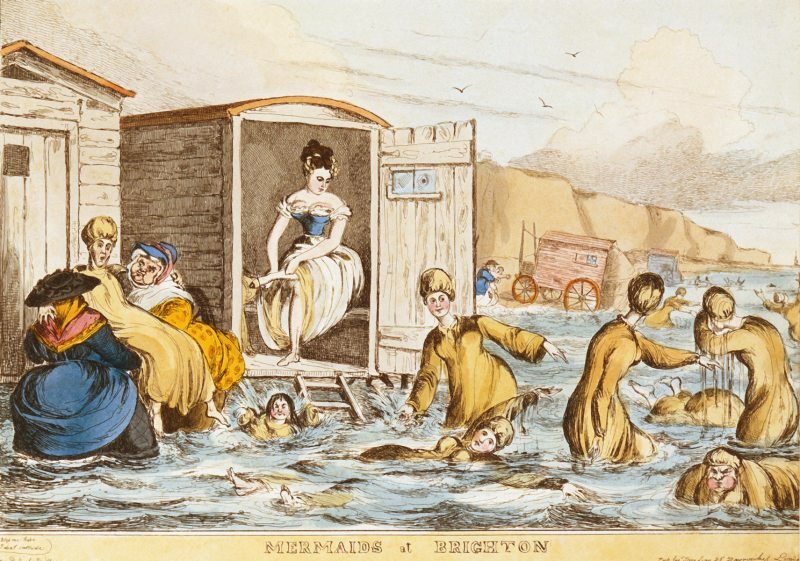 Depicts women sea-bathing with bathing machines at Brighton. 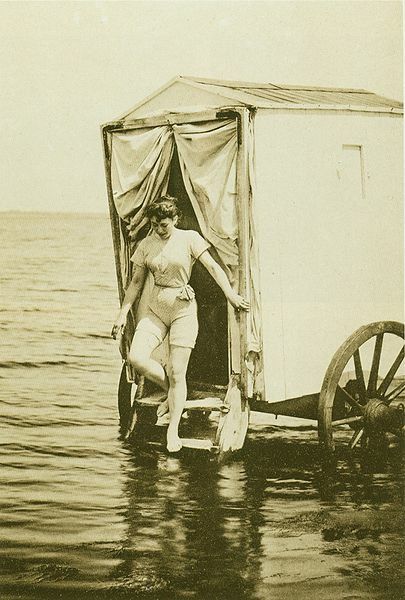 I know it’s November, but I think now is the perfect time to talk about some of the eccentricities of beach etiquette in the Victorian era. Because you know that cozy outfit you’re wearing right now? Imagine wearing that on the beach. Summertime fun! Bathing, whether by spa or by sea, began as a recreational activity in the mid-1800s. Prior to that, prolonged time in the water was assumed to cause instant death (something about water opening the pores so all the disease can get in). But by the mid 19th-century, many doctors began espousing the restorative and medicinal properties of a good soak or swim, and the middle-class began associating cleanliness with refinement, and dirtiness as a sign of disease and immorality. So all of a sudden, everyone wanted to go to the beach, and realized you couldn’t really do this in your everyday clothing. Beaches have always been fun for men. They could bathe in their underwear, within full view of any delicate woman. But women had to hide their beach bodies and activities. According to Victoriana Magazine (why don’t I have a subscription to this), “Women typically dressed in black, knee-length, puffed-sleeve wool dresses, often featuring a sailor collar, and worn over bloomers trimmed with ribbons and bows. The bathing suit was typically accessorized with long black stockings, lace-up bathing slippers, and fancy caps.” This just goes to show you that even though we still argue about abortion and health care and intersectionality in feminism, things have changed. I am wearing a more revealing outfit right now, and I’m at work. Also I am a woman at work. As you can imagine, these bathing outfits were not really easy to swim around in. In Extraordinary Origins of Everyday Things, Charles Panati mentions that there were a number of fatalities in Europe and America due to “waterlogged bathers caught in an undertow.” But, y’know, modesty. Now, these outfits were only appropriate for the beach, so how did a woman get into them? Surely you couldn’t just hop in the car with a sarong around yourself. No, for this, we had bathing machines! These devices first showed up in England in the 1750s and lasted until the early 20th century. W.C. Oulton in The Traveller’s Guide; or, English Itinerary, Vol II describes them as “four-wheeled carriages, covered with canvas, and having at one end of them an umbrella of the same materials which is let down to the surface of the water, so that the bather descending from the machine by a few steps is concealed from the public view, whereby the most refined female is enabled to enjoy the advantages of the sea with the strictest delicacy.” Once in the water, a “modesty hood,” sort of like an awning, hid her activities from male bathers. Like with most practices of modesty, we got over it, probably faster because of that whole drowning thing.